Our target plant for the day was Thelocactus hastifer with T. leucacanthus as a bonus, as we had already seen this yesterday. A few km from the hotel, passing our first hillside of Echinocactus platyacanthus, giant barrels, the boys, Cliff & Ian, for whom this was a first time experience, begged for a stop. It would have been cruel to refuse. But we’d see many more and there was so much more to see. S3040 in the order their pictures were taken: Myrtillocactus geometricans, in flower, Echinocactus platyacanthus, Mammillaria sp #1 (large clump), Mammillaria sp #2 – small clump of flat plants), Thelocactus leucacanthus, Stenocereus pruinosa, Stenocereus dumortieri, Coryphantha sp. Hechtia sp, Yucca sp, Ferocactus echidne or F. histrix, with yellow flowers. It seems that during the first few days I have called these Feros ‘echidne’ but later on in the trip changed them to ‘histrix’. Both occur in a similar area, including here in Hidalgo and both can have yellow flowers, although F. echidne can also have red flowers. Here I assume that single stems rather than clustering points to F. echidne. Cylindropuntia sp, Mammillaria elongata, growing on cliff walls and underneath shrubs, Mammillaria albilanata, may be M. perbella, with fruit, Opuntia sp (several) Agave sp. Fouquieria fasciculatus (supposed to have white flowers – none seen), lichen, Asclepias subulata, Bursera sp, Ferocactus glaucescens, Ferocactus hystrix (or is it F. echidne? ), Hechtia sp., Mammillaria sp (albilanata? 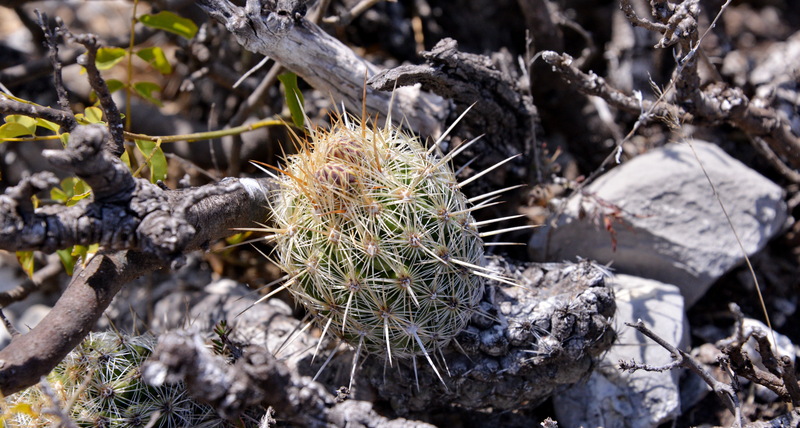 ), Mammillaria elongata, mostly ssp echinaria, with central spines. Throughout this trip, whenever we’d see M. elongata, it would be ssp. echinaria. Only tomorrow, would we find the spineless form, ssp. elongata. The NCL reports that ssp. 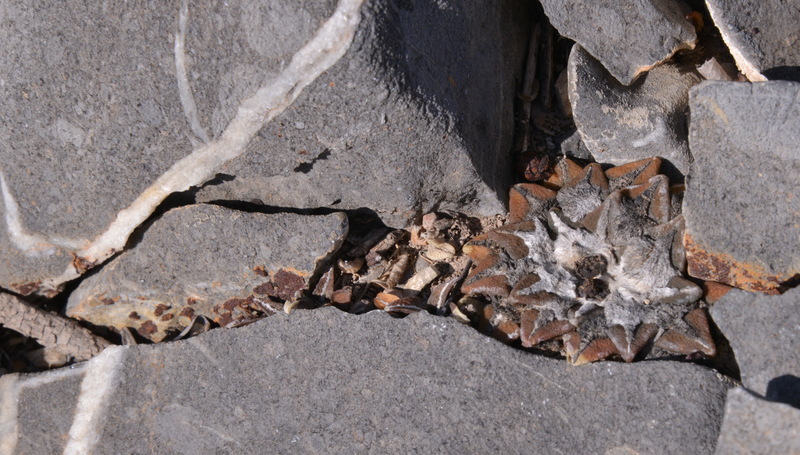 elongata is restricted to cliffs and rocks like the Barranca de Toliman, also in Hidalgo. 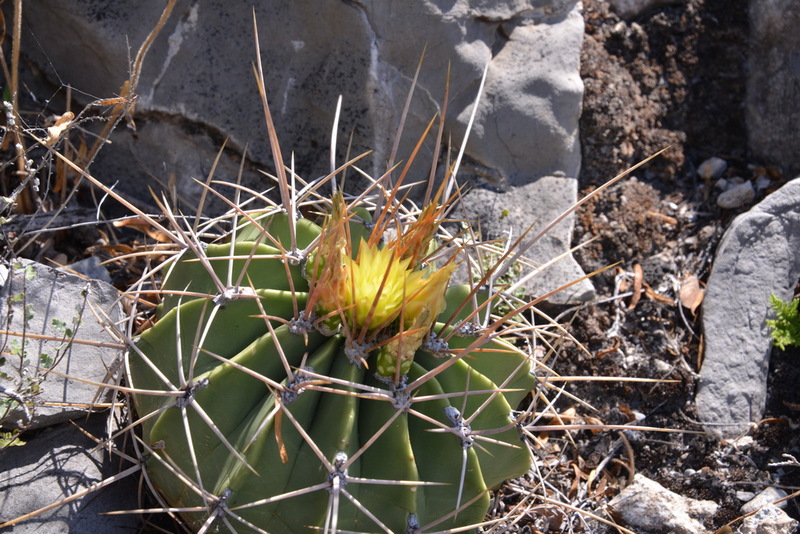 S3042 – Ferocactus echidne or histrix? Echinocereus pentalophus, Astrophytum ornatum, Neolloydia conoidea, Ferocactus echidne and F. glaucescens (nice glaucus seedlings in the shade, boring green in the open. Jatropha urens – the evil woman, it stings!, and of course the omni-present Echinocactus platyacanthus. S3043 – as we reached the lake where the road passed through three long tunnels. As we came up for air before we disappeared into the next on, we could see more cactus vegetation. We could not hang about, as there were other cars on our backside so I just snapped away at the hillside for closer inspection later, which suggests that a few Golden Barrels have indeed survived. 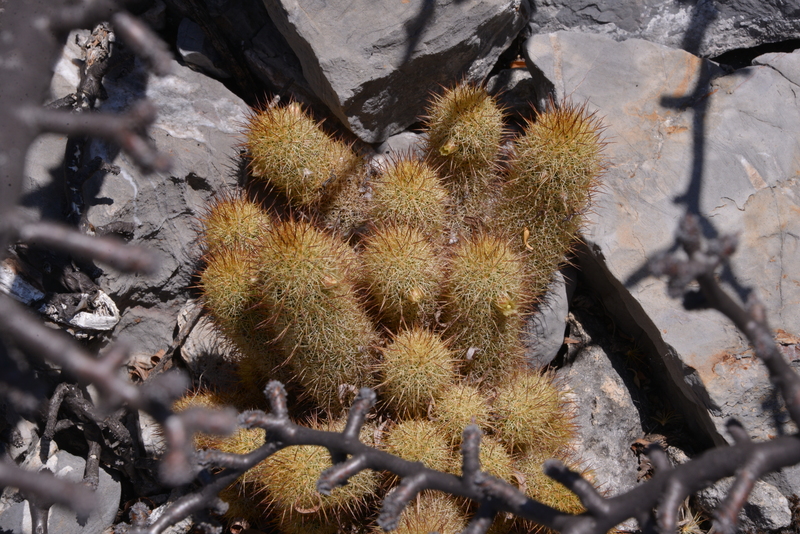 I believe I caught at least two large golden barrels, Echinocactus grusoni, probably the world’s most common cactus in cultivation, but here, in its type locality practically extinct, as the building of the Zimapan dam left the majority of the ‘grusoms’ several 100 ft below the water level. Before the dam was completed, volunteers, including Charlie Glass, went on rescue missions but as anyone who tried to repot just a medium sized plant might know, this is a weighty issue! S3044 – Thelocactus hastifer – Hooray! our target plant of the day. Relatively few plants found, including one large many headed plant growing in shrubs and therefore tricky to photograph. But perhaps the star of the day was a small, grapefruit size plant of Echinocactus grusoni, golden yellow spination and looking just like the long spined form sometimes seen by the million in Dutch nurseries, raised from cultivated seed. With the local construction work now apparently complete, perhaps the time has come to sow some of the seed available from cultivated plants back, so that once again these golden barrels can be seen in their natural habitat. It’s assuring to see that there is still a natural seedbank from which this species could recover. S3045: Ian spotted a change in the geology along the side of the road – vertical limestone bedding and suggested a stop without knowing what we might find. I was tired enough to stay in the car, until my snooze was disturbed by Ian’s cry to come and look: Ariocarpus kotschoubeyanus ssp elephantidens – the point of interest here being that some plants had a clear papillose epidermis, a feature of ‘elephantidens’, while its neighbour had smooth tubercles. Does this variability within a species in a population justify a separate name at ssp. rank? Not for me – cultivar perhaps?